If you are incorporating some patching process during your OS Deployments, you’ve undoubtedly come across the issue where some patches released by Microsoft cause multiple reboots. These additional reboots are unhandled by the task sequence, which causes it to quit with little explanation. This is documented in the following MS KB article, where MS also maintains the list of patches that are known to cause this: http://support.microsoft.com/kb/2894518. Depending on how you do your patching, there are different ways to handle this. One way to do it is to update your reference images to include the patches. But it may not be practical to do this every time a new ‘multiple-reboot’ patch is discovered. And let’s face it, it cannot be done quickly. If you are using the Software Updates feature of ConfigMgr, then you can remove those patches from both the Software Update groups and the Deployment Packages, and make sure your ADRs don’t try to pull in those patches again. If, like me, you use WSUS to patch your builds, which is nicely documented by Chris Nackers here, then you can use the WUMU_ExcludeKB variable either in your customsettings.ini file, or in the task sequence itself, to block the patches from being installed. However, I have seen some reports that this is not 100% reliable. 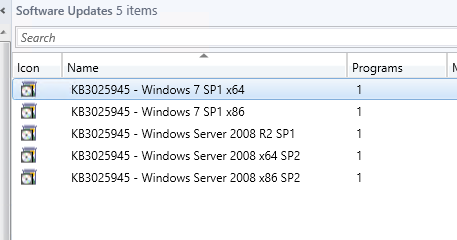 My preferred method to do this is simply to ‘decline’ the updates on all our WSUS servers (which are standalone). This prevents them from being installed by WSUS as only ‘approved’ updates can be installed. Obviously to decline all those patches manually would take some time if you have a few WSUS servers as we do, but thankfully Powershell can help us. Here are a couple of scripts that I use to do this. 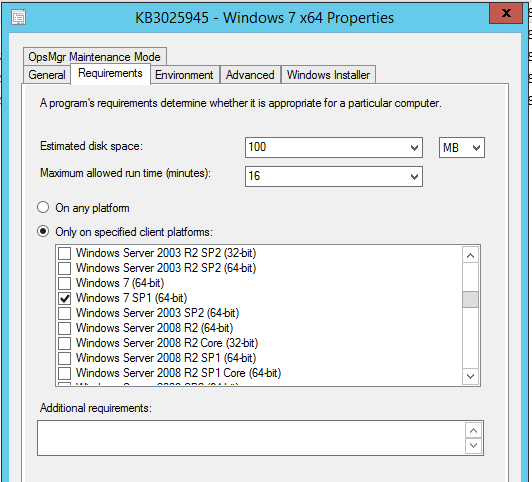 The first will search each WSUS server for any of those ‘multiple-reboot’ patches by using the KB number. Then it will report on the approval status of each patch so you can identify if it needs to be declined or not. The next script will then go ahead and decline all those updates on each WSUS server in succession. You could run the first script again afterwards to verify that the updates were declined. Logging is done in brief to the console, and in more detail to a text file which shows you each patch and it’s status on each server. This script will search for all the updates in the $Updates variable on each WSUS server in the $WSUSservers variable, and report their approval status. It logs to the console and more detailed logging to a text file. It logs to the console and more detailed logging in an html page. $html += write-output "## Searching for updates on $WsusServer ##"
$html += write-output "KB$Update found. There are $count updates with this KB." $html += write-output "Found $finalcount updates in total"
Again, logging is done in brief to the console, and in more detail to a log file which shows you each patch that was declined. This script will decline all updates with the KB number listed in the $Updates variable on each WSUS server in the $WSUSservers variable. It logs to the console and more detailed logging to a log file. 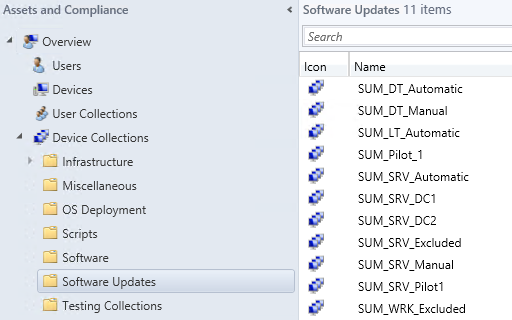 In our SCCM 2012 environment, we have a subfolder of device collections that are used for Software Updates. I wanted to get a list of all the members of the different collections in that folder. 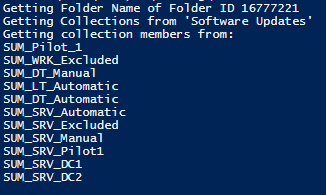 I saw a recent post by Kaido Järvemets on how to easily list folder objects using Powershell, so I decided to implement that code into a script that exports all the collections and their members in a ConfigMgr folder you specify, into a text file. You need to get the ContainerNodeID from WMI as Kaido describes in his post, then add that and your site code to the script. Write-Host "Getting Folder Name of Folder ID $FolderID"
Write-Host "Getting Collections from '$FolderName'"
Write-host "Getting collection members for:"